Today I came with an awesome WhatsApp trick, How to write Bold, Italic and strikethrough text in WhatsApp. Recently I got message that contains bold, italic text in WhatsApp. I was socked to see bold and italic text in message. As we know there are not any options in WhatsApp to write bold and italic word then how they send bold and italic typed words. After reading WhatsApp message, I searched in Google – How to type bold and italic words in WhatsApp than I got it. Actually, there are thousands of article written on this topic. I thought Why not, I should write this for my blog visitor. So today I post this awesome and interesting WhatsApp hack. Ohh sorry 🙁 …!! This is not hacking, is WhatsApp tips and tricks. This is new WhatsApp features and is for all WhatsApp user whatever he uses Android device, Java Phone, Blackberry Smartphone or iPhone Os. How to Write Bold text in WhatsApp? 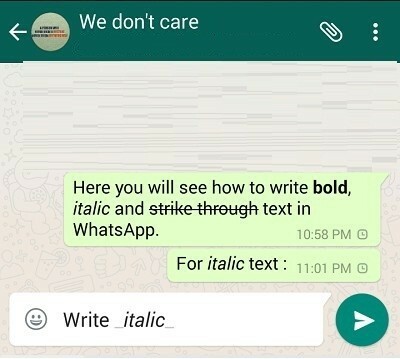 How to Write Italic text in WhatsApp? 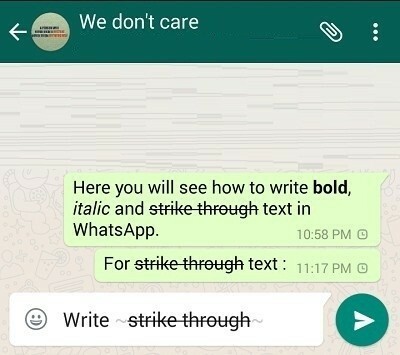 How to Write Strikethrough text in WhatsApp ? Write * before and after the word/sentence. Ex: If you want to bold this KuchJano then write *KuchJano* and send it . WhatsApp program will auto change *KuchJano* in KuchJano bold text. That’s the way for writing bold text in WhatsApp. Do the same as told in above but only you have to change from * to _ (underscore) . Write _ before and after the word/sentence. Ex: If you want to italic this KuchJano then write _KuchJano_ and send it . WhatsApp program will auto change _KuchJano_ in KuchJano italic text. That’s the way for writing italic text in WhatsApp. As we see => * for bold text , _ for italic text . And if you want to write Strikethrough over the text then use ~ . Follow Above Process and replace ~ instead of * and _ to write Strikethrough text in WhatsApp messages. 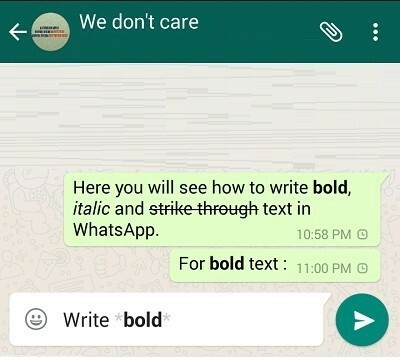 Now Go and write bold, italic and striketthrough text in whatsapp message. If you like this stuff then Please Like our Facebook fan page to get latest update. Install 15+ Whatsapp App in one Smartphone, Must try..! !